Did you know that Apple has sold over 350 MILLION iPads, iPhones, and iPods? Did you know that NONE OF THEM see FLASH? If you are, 350+ MILLION people can’t see it and most likely get the ugly message below that tells them to download it – but they actually can’t download anything that fixes the problem. The problem can’t be fixed. With more and more people using their mobile and tablet devices to access the Internet – in this case Apple iOS devices – the use of FLASH just doesn’t make sense. It actually is likely to hurt you Internet marketing efforts as you are limiting your audience of potential users, if not aggravating potential new customers. Getting a message like this is not a good first impression. People will just leave, click back, and look for something else. 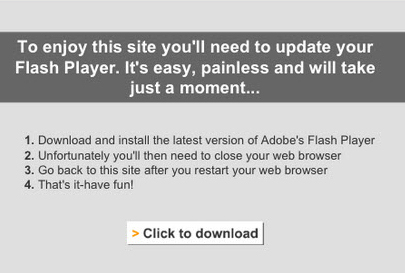 If you’re using Flash, talk to your webmaster or Internet marketing consultant and discuss other options. There ARE other options and they all work great on Apple iOS devices.